Table 1. States with nonindigenous occurrences, the earliest and latest observations in each state, and the tally and names of HUCs with observations†. Names and dates are hyperlinked to their relevant specimen records. 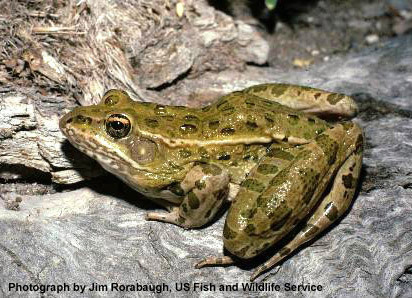 The list of references for all nonindigenous occurrences of Lithobates blairi are found here. Remarks: Frost et al. (2006) revised the genus Rana and most of the North, Central and South American "true frogs" were seperated from this taxon and placed into the new genus Lithobates (Frost et al., 2006; Crother, 2008; Collins and Taggart, 2009). Scientific and standard English names follow Crother (2008). Collins, J.T. and T.W. Taggart. 2009. Standard common and current scientific names for North American amphibians, turtles, reptiles, and crocodilians. Sixth Edition. Publication of The Center for North American Herpetology, Lawrence. iv + 44p. Livo, L.J., G.A. Hammerson, and H.M. Smith. 1998. Summary of amphibians and reptiles introduced into Colorado. Northwestern Naturalist 79(1): 1-11.